...None approached the Boswell combination of vocal excellence...originality of arrangement and musicianly sophistication. Here they are, those brave souls who said, “I love this music and I’m gonna sing it”. Check out their sites, their sounds and the spectacular feats of musicianship they attempt in the name of the Boswell Sound. Puttin’ the Sun Back in the Sky since the late 70s, the Pfister Sisters music has the “Authentic, Grade A, New Orleans” stamp on their fabulous sound. Crush a little mint, pour a little bourbon: their great music will provide all the sugar. Company B Jazz Band is Vancouver’s Boz-O- Plenty. The 6-piece ensemble features a female vocal trio (à la the Boswell Sisters) framed by clarinet/sax, guitar, and upright bass. The ensemble met in college and have been playing together since 2007. Bozzies.org had the privilege of hauling gear and bringing beer when they brought perfect harmony to China during the 2015 Nanjing International Jazz Festival. Watch this and get your Boz on! The king of Spain has given more than just Minnie’s hand in marriage – he has given us the marvelous Spanish trio, O Sister. Comprised of siblings Paula and Marco (yes, Marco) Padilla and Helena Amado, they have captured the spirit of the Boz, albeit with a slightly different southern accent. If your español is up to snuff, check them out at http://osister.es. A mighty joyful noise has beeen eminanting from the promised land. The Hazelnuts are a unique musical phenomenon in the Israeli music scene – sweeping large and varied audiences off and on their feet with the swing fever. Rockin‘ hot Boz-infused vocals let the singers and their four piece band soar to the heights of harmony. They combine 1930’s songs with their own compositions, all of which they arrange themselves. Hallelujah! Three talented singers went searching for a project they could work on together and what they found was the life-changing experience of being Bozzed! Since 2012 The Boswell Project has been on a Boz trek that has led to sold out concerts from their native Adelaide, Australia all the way to New Orleans. Oi, oi, oi is now the Aussie word for Yowzah! Bite into this confection and taste how fresh the Boswell Sound is after 70 years! Their new CD is out and they are eager to let you sample their wares. Good stuff! The special bond that exists between sisters is at the heart of the Boswell story. So it only makes sense that some of the best interpretations of the Boswell sound is made by siblings. So it is with the New York based DiGianllonardo Sisters who have been singing together since early childhood. Daniela, Nadia and Christine are each independent career musicians. 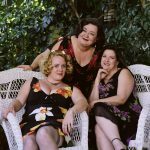 All three sisters have appeared numerous times on “A Prairie Home Companion” with Garrison Keillor. Last December, they released their renditions of “O Holy Night” and “Silent Night;” each can be downloaded as an MP3. Their Boswell work, which was featured in “Perfect Harmony” a review presented in New York’s 92nd St. Y, can be heard at http://www.reverbnation.com/DiGiSisters. They played Martha, Connie and Vet in the 2001 Old Globe production of “The Boswell Sisters.” But even after the show closed, these three busy performers “Just Couldn’t Say Goodbye.” They began performing as “Shout Sister” and are headed back to the studio to record more of the of the tunes made famous by those syncopating sisters from New Orleans. Yowza! Bozzies.com owes a huge debt of gratitude to the research and creative energy that Jan Shapiro, voice department chair at Berklee College, has expended on the Boswell Sisters. Visit her new website and check out her recordings. In 2000, Jan and fellow music educators Lisa Thorson and Adriana Balic, paid homage to the Sisters with the CD “Boswellmania”. They use the same arrangements that the Bozzies put together back in the 30s and give us an idea of how the Sisters might sound if they were recording today. Mercy beaucoups! Montreal has a talented trio whose unique combination of Boz-infused swing, jazz and French chanson is wonderfully entertaining. Carolyne Legault, Mélissa Brosseau and Nathalie Maillard form the vocal core of Singin’ Rendezvous. Gotts love these Crazy People! Have a member of the flock you wish to add to this page of true believers? Send it on in and bozzies.com will review it! Thank you for stopping by! Bozzies.com and Bozzies.org are non-profit organizations dedicated to keeping alive the memory of the Boswell Sisters and their wonderful contributions to the history of music and performance. Our mission is to pull together the best Boz content available for the enjoyment of all Boswell Sisters fans, and we hope to inspire those new to the Boz as well! We greatly appreciate any donations to help keep us Bozzing, and we truly hope you are enjoying your visit. As always, please feel free to contact us with any questions, comments, or suggestions!